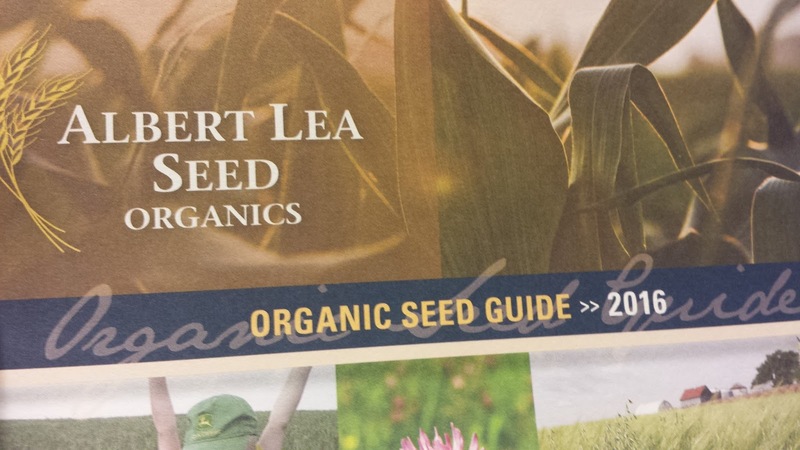 Got an early seed catalog today; reminds me to start thinking about my 2016 crop plan. I'm talking about corn a fair bit, and the primary reason I do is that it's one of the most calorie-intensive crops per acre on this plant. Roughly 15 million calories per acre. So in terms of efficient use of space and equipment, it's very, very hard to beat. I completely understand why its such a popular crop worldwide. 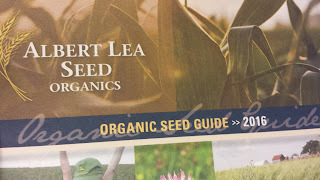 I'm purchasing organic seeds to maintain the organic certification that I expect to reach May of next year. 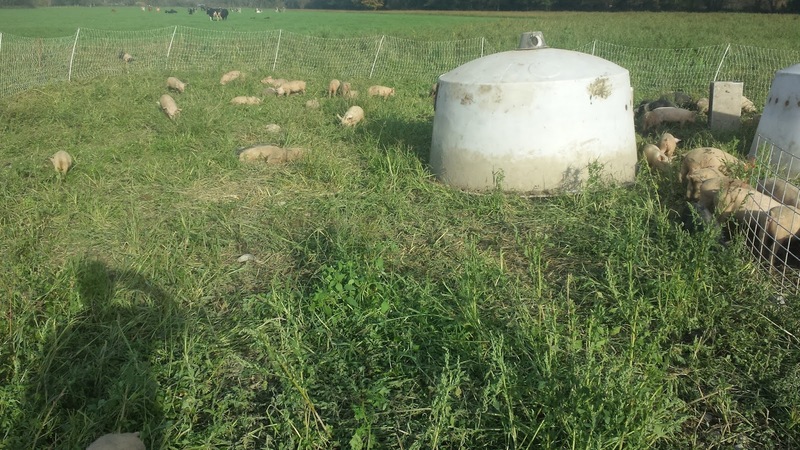 It's not very important for my pig operation, but organic certification for my dairy is pretty important; organic milk pays about 15% higher than conventional, and every penny counts. 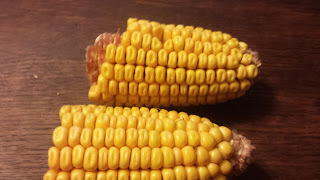 I'm still evaluating the corn, but so far, so good. 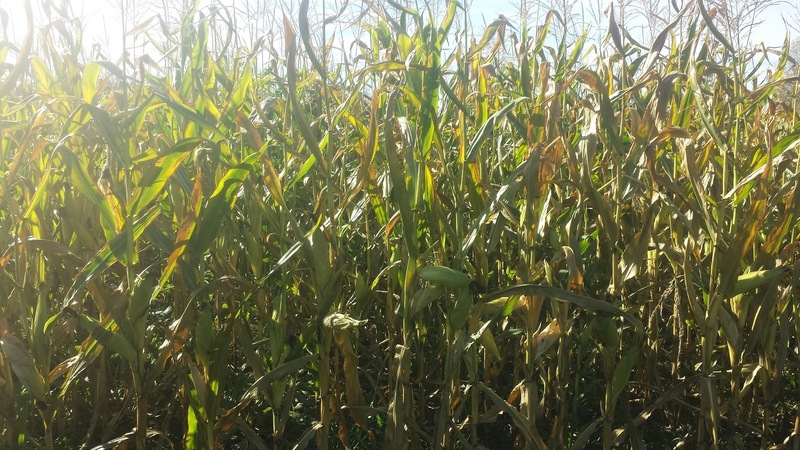 I planted 90 day corn this year, but didn't get it into the ground until June 1; I could probably have planted it in May, but there were some equipment problems that prevented that. The long-term forecast for next year continues to be warmer and dryer than usual, and I'm looking carefully at longer-growing corn varieties. 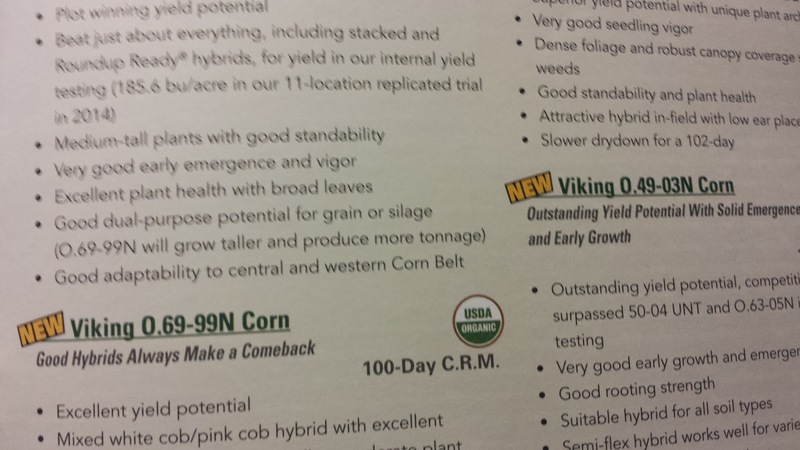 If I can get it into the ground sooner I can take advantage of the longer grow period to have higher yields. 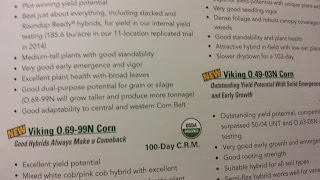 Or I may split my order and go for another short-season corn and try a longer growing and compare the two. I'm also going to save some of the seed from this harvest and see how it does. 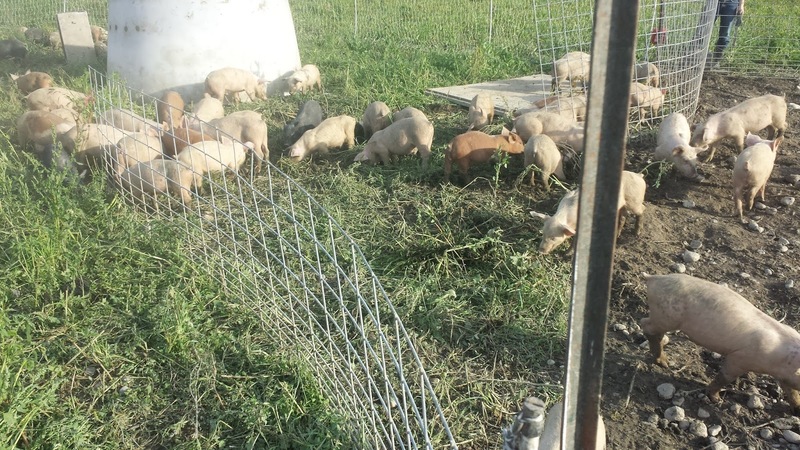 I'm going to grow a few acres of winter wheat this year; I'll harvest it next summer. I'm tilling the ground to do that, but without using a drop of diesel or an hour of tractor time. 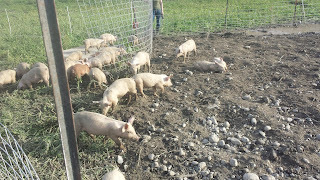 Pigs do a great job all by themselves, and they enjoy doing it. 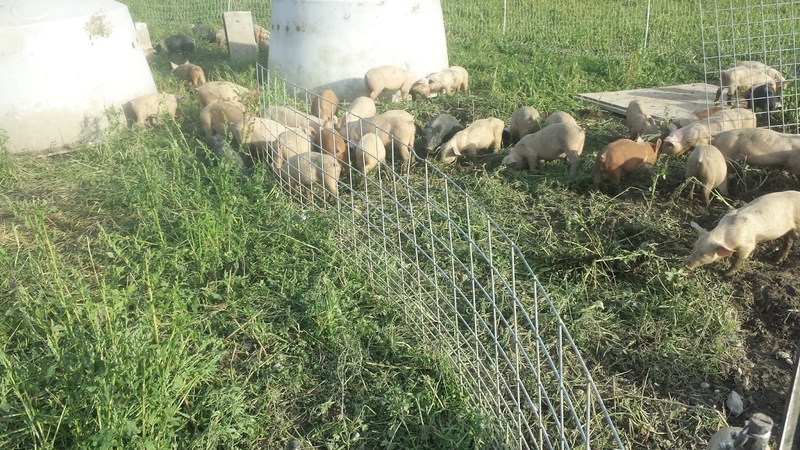 I've got a couple of lengths of electric net fencing that I use mostly to keep the cows away from the pig feed, and partly to keep the pigs in, but mostly the cows out. 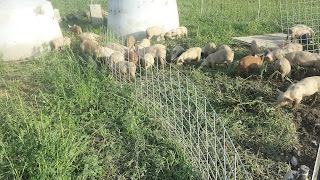 The pigs feeders are full; despite having free-choice feed available they'll eat every bit of their greens with relish, and even dig up most of the roots. 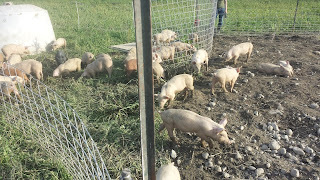 I will probably use a little bit of tractor time once the pigs have done their work - I prefer wheat on a flat field, and the pigs will tend to leave little divots and wallows, but 10 minutes with a harrow will fix all of that, and then a pass with the grain drill, and all is good. I have to give Gene Logsdon credit for coining the pancake patch; in his book small-scale grain raising Gene talks about growing small quantities of grains for your homestead use, and I thought that was a good idea. I purchase a little electric flower mill, and I'm all set. Something pretty satisfying about your own sourdough from your own grain; more so than store-bought. 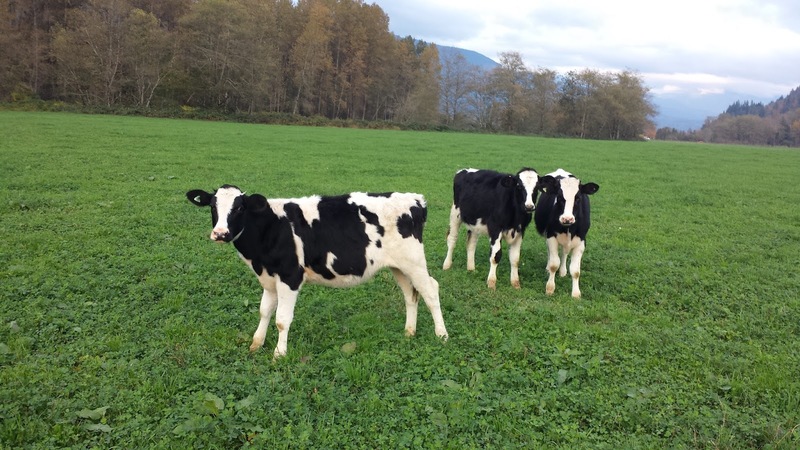 These heifers are part of the 2016 milking string. they're out enjoying the grass and alfalfa on a cool fall day. Cool - but still warm enough that the grass is still growing. 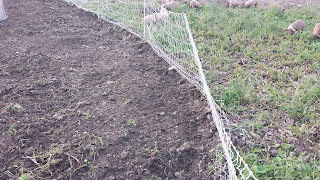 To maintain the alfalfa, I don't cut it for 6 weeks before the first frost; that allows the plant to grow a little and store nutrients in its root so that it'll be ready to go next spring. 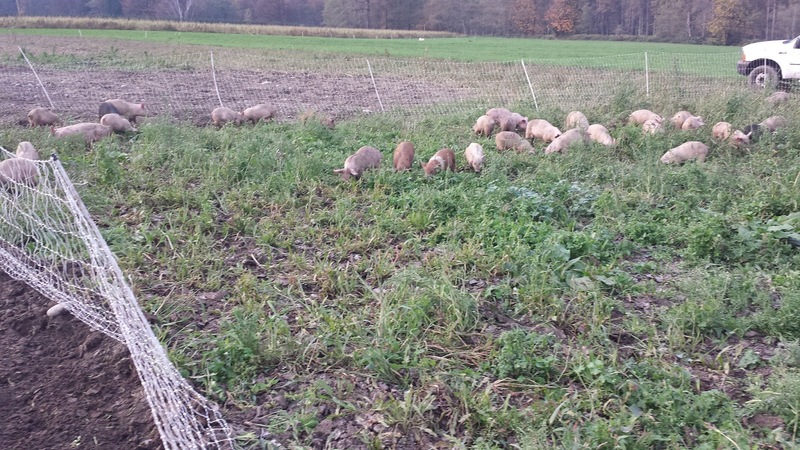 In the meantime a little grazing doesn't hurt, and it saves the hay I put up for later in the winter and next spring. Seeing a little fall color in the hillsides. 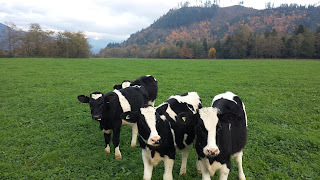 Plus the cows like it, and it's easy. Win win! 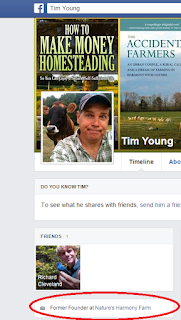 Tim Young is now advertising his status as "former founder" of natures harmony farm. 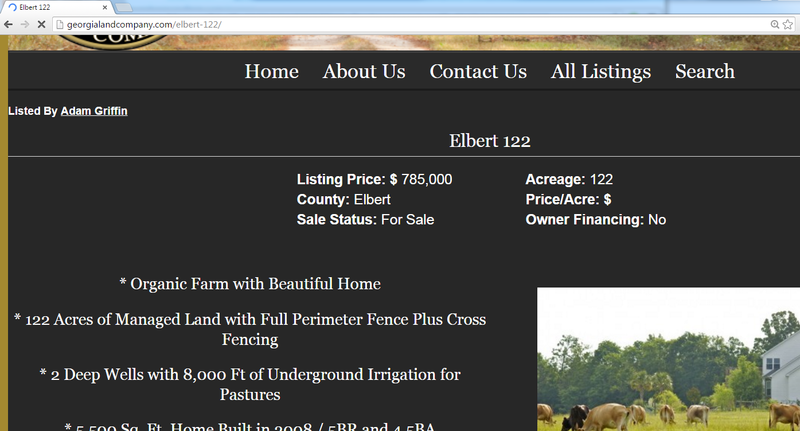 He's apparently been trying to sell his farm for quite a while now, lowering the price periodically, and its still listed for sale. UPDATE: The cheese business was apparently sold in April of this year, according to "cheese@naturesharmonyfarm.com"
listed for $785k now. Still apparently unsold. He's now a survivalist expert - in between the advertisements for gold coins and body armor, you can hear him speak about... well, whatever it is he has to say. 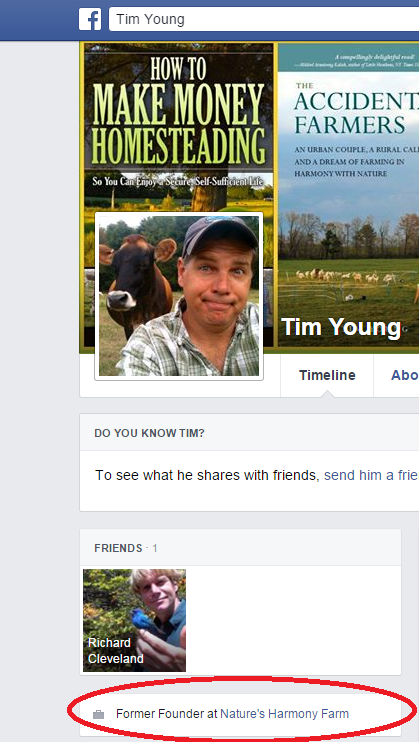 Good luck in your new venture, Tim. It's my opinion that other things you've tried didn't work out -- lets hope that you have some success in this new venture. 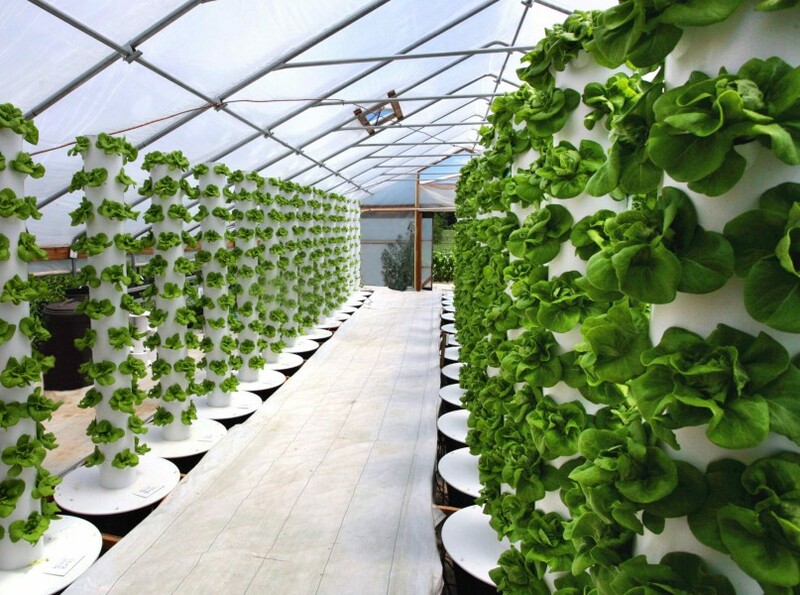 "indoor agriculture", "vertical farms", "urban farms"
All of this attention, hundreds of millions of investment in "new" ideas. But none of them are as cheap, or as proven, as an open field, rain and sunshine. 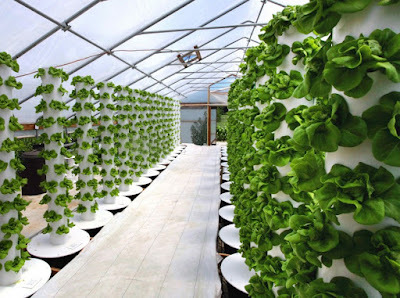 For some specialty crops greenhouses with natural light and maybe a bit of artificial heat - like the hothouses they use to grow tomatoes in british columbia - but this constant harping of "vertical farms" in my opinion is best described as a way to soak the investors. I'm hugely skeptical that any of these efforts are 'sustainable' in the sense that they'll be in business in 20 years. the $100 million that kkr invested will be returned by selling shares in this 'new' farming venture to more gullible people. 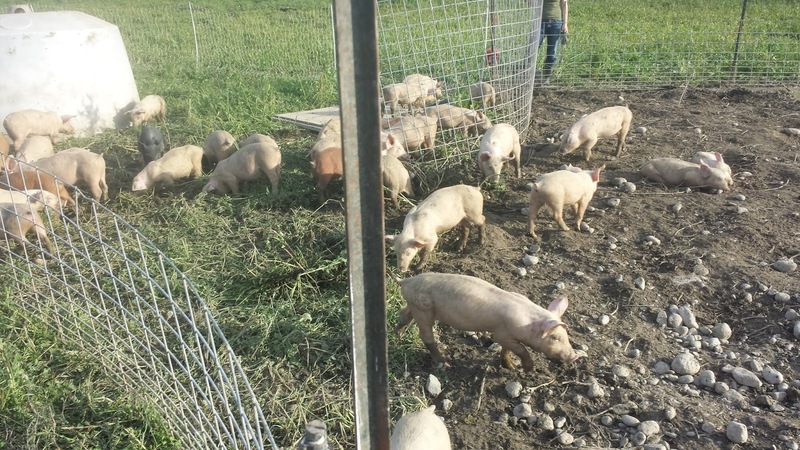 the "challenges' they list - unproven equipment and techniques, funding, and labor - ignore the fact that we have proven techniques, funding and labor for conventional farms. 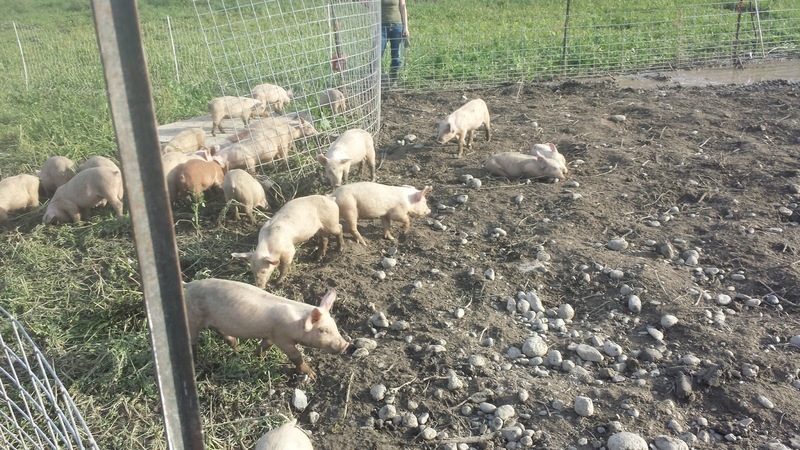 the only risk here is whether we can get someone else to buy the pig once we've applied the lipstick. 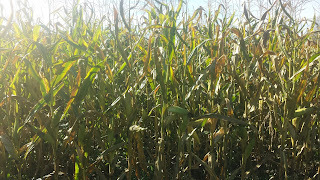 Last winter I read the long term forecasts for the weather; and decided that the forecast predicting a warmer and drier year than normal meant that I could plant some grain corn. 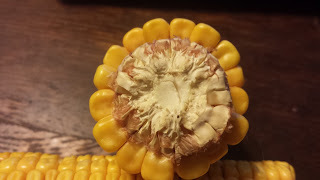 The corn turned out better than I expected and every week I've been watching it as it matured and now as it dries. 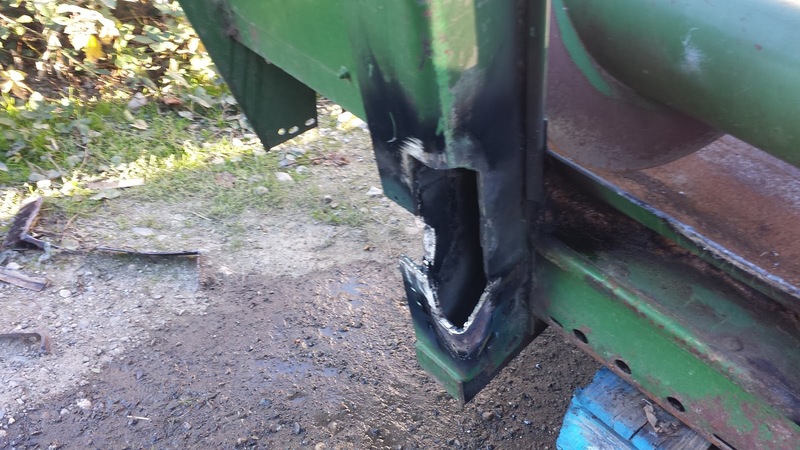 The combine is working; greased and oiled and charged up. the corn head is welded up and ready to go; I'm hooking up the grain drier this week so that I can dry the corn down to something that will keep very well - I'd like to be able to feed this corn to my pigs for the next year. And I should probably start thinking about putting aside some of this crop for the seed corn for next year. 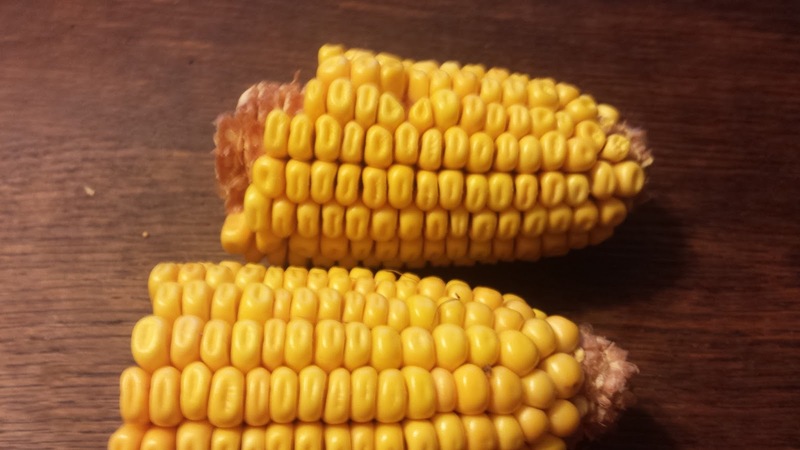 I've been pretty pleased with it; it's open-pollinated organic corn; so unlike hybrids should be pretty similar next year. Plus it's a heck of a lot cheaper to put up my own seed than buy it again. Seed corn is expensive. 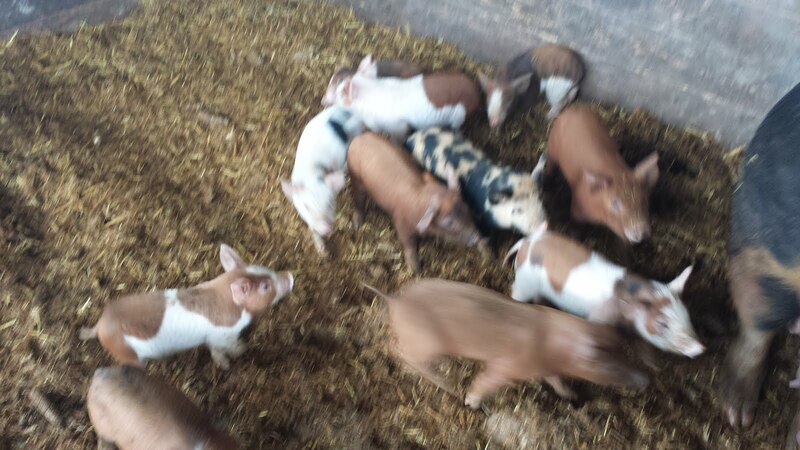 Left a pen of piglets a little too long in one spot -- pictures tell the tale. I'm going to switch to the electronet fencing to make the pen rotations easier. 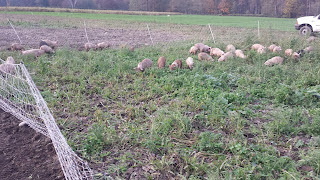 Pigs, left in an area, will eventually remove all vegetation of all sorts; parts of it they will eat, parts they'll just root out of existance. Most of the green growth around here the pigs like to eat; and in particular they'll seek out some of the roots of the local weeds. This area wasn't planted; it's fallow this year, and not very good soil for me - lots of rocks, with a layer of clay a few inches underneath that makes drainage poor. 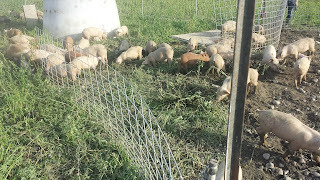 But as a place to rotate piglets through it's fertile. One way to get use out of an otherwise low-value area. There's a list down the right side of "blogs I follow", and most of them post pretty infrequently anymore. So do you have a blog related to farming that you follow that produces at least a post a week? ...out comes the tape measure and the cutting torch, and with a little bit of work and grinding, the hole is big enough. 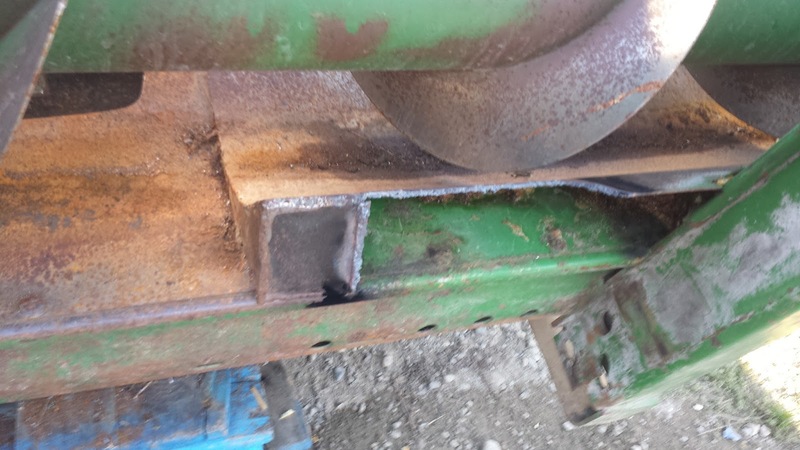 I'll weld in some flat stock equivalent to what they had there before and then paint the whole thing green. They also added some odd "improvements" to the implement. On general principles I'll leave them there, but you can see the original JD green below the area they added, that little ramp-looking thing. And the final change was the location of the PTO shaft. They'd lowered it 3.5", so to fix it took a couple of days -- take it apart, drill the holes that they'd filled in, and then grind and clean the area and bolt it all together with gasket sealer to hold oil around the gears. For all of these modifications you could see where the orignal parts had been installed; wear marks and drilled holes and so on, so I wasn't working blind -- I had a template where to put things, but I didn't expect to have to do this work; I figured if it was a JD 443 corn head it would just fit a JD 7720 combine. Silly me! 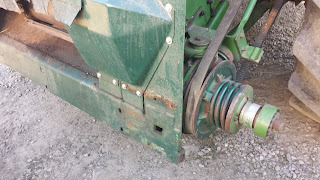 I'm still 2 to 3 weeks away from combining, so this isn't an emergency; I'll put the whole thing together tommorrow and test it on some corn to make sure it works. Hopefully after this harvest season I'll clean the combine out, grease the head and then park the whole thing in the barn until next fall. I need it to work for about 15 hours this year. I'm looking forward to it! I purchased the farm I'm on in 2013, and since then I've had quite a few power outages. Some lasted for hours, some for days, and the most recent one was one of the longest: 5 days without power. 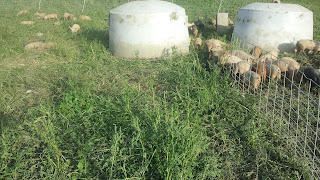 The pump and pressure system for the farm runs on 240 volts, and the little generator doesn't do that, which is unfortunate; and no other 240 volt appliances work, either. So no stove, no clothes drier, no welder. I'm lucky that I switched to a tankless propane-fired water heater, or I'd have to add no hot water, but with no water at all I hadn't reallyh noticed. In the last two years I've gotten it down to a routine. Power goes out, fill the tank on the generator and put it on a pallet. Use the skidsteer to set it in the back yard, far enough away from the house that the noise isn't too distracting, and run extension cords. One cord to the tv/sat dish, one to the computer, one to the microwave. Two cords go to each set of freezers (we have 6 total) and one cord goes to the chicken egg incubators in the barn. Crank the generator up, and then move around the farm plugging in each item to spread the load out, one freezer at a time, one plug at a time. It's a bit of a hassle, but with the incubators I can't let them go cold, and so when the power goes out I drop everything I'm doing and go set up the generator. Sometimes I'm halfway through and the power comes back on, sometimes it's days. It's pretty annoying. One of my neighbors solved the problem with a pretty nice system; a standby generator and automatic transfer switch. The generator is big enough to run his entire house, and the switch notices when the utility power goes out, and automatically starts the genrator 10 seconds later; once started, the switch goes from utility to generator, and that's it. 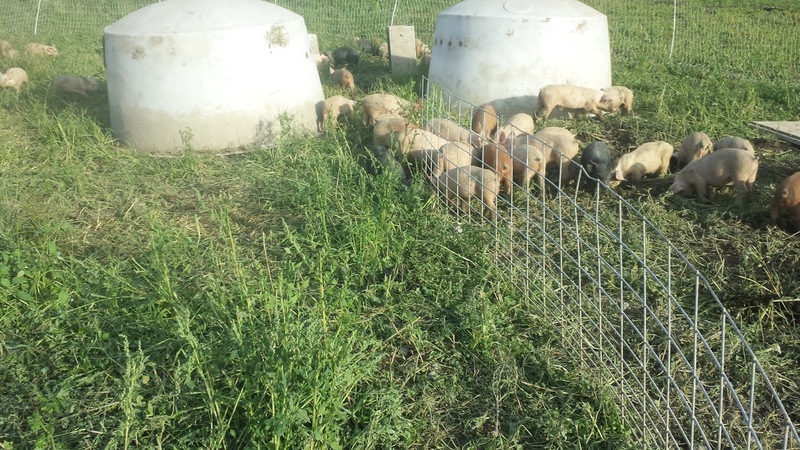 no intervention required, no extension cords, and for the farm, water heat and light are all restored 10 seconds after being lost. The way that it works is that you add the switch between your electric meter and your houses power panel, inline. Doing it this way means that the house doesn't have to know where the power is coming from, and if you pick a generator big enough to run the house (say 20,000 watts or bigger) you don't have to select which circuits have power - everything is powered. For this particular project I chose a propane-powered generator, 22,000 watts, with an aluminum case. This type of generator is usually installed on a concrete slab poured on the ground, but the ground next to my house is actually flood plan, so I installed it on a wood platform above the flood level. To meet code I had to put a layer of fireproof insulation (hardiboard) and then a sheet of metal on top of that. 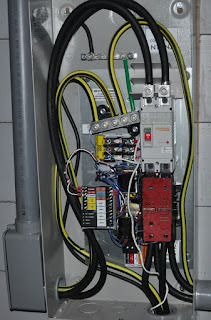 Installation of the transfer switch was pretty straightforward. I purchased 25 feet of the appropriate gauge wire. I detached the wires from the base of the meter, ran the wires into the connections in teh transfer switch, ran the wires from the transfer switch into the existing breaker panel for the house, and then attached the wires from the generator. Other than the power wires there are smaller wires that do the signaling between the generator and the transfer switch - the "sense" wires that allow the detection of utility power fail, and the relay power wires that flip the power from utility to generator. you'll see those wires in the picture above as a small white wire. In the picture above the utility wires enter the transfer switch at lower left, then loop around and connect to the switch in the upper right. At the bottom right there are two sets of cables. The cables that enter from the bottom of the box straight up are the input power from the generator. The cables that run out the right side of the box go to the existing electrical panel replacing the cable that used to supply utility power. Once installed the operation is automatic. Power goes off, generator goes on. Power goes on, generator goes off. 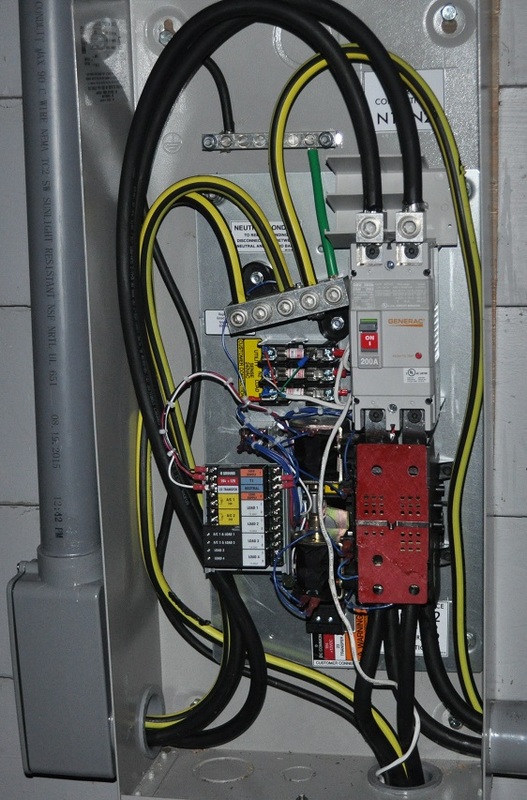 This particular transfer switch has a utility shutoff breaker -- if the uility power is browning out you can manually shut off the utility power, which the switch will interpret as a utility power failure and start the generator. This makes it easy to test the operation of the unit, too. The generator will start and run for 15 minutes every week; distributes the oil over the working parts, charges the batteries, makes sure things are in good shape. While I was doing this work I lowered the main breaker panel for the house by 5'; this house was jacked up from the ground and a foundation put under it to raise it above the flood plain. But they didn't move any of the panels, so the house breaker panel was 7' above the ground; every time a breaker flipped I h ad to go get a ladder to reset it. With the main panel lowered to normal height it's both easier and safer. If you're going to do something might as well do it right, and do it all. No half measures.